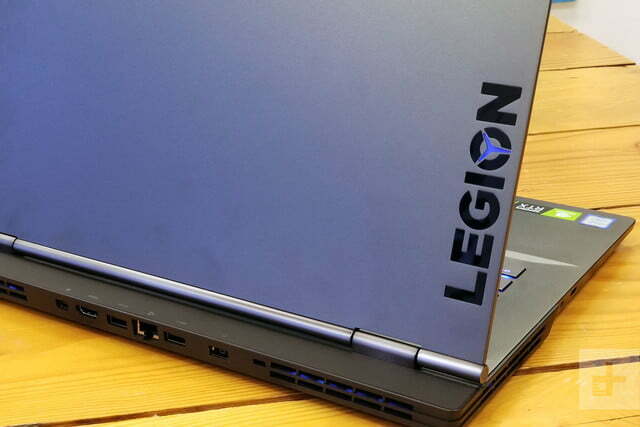 The Legion Y740 15 is an affordable gaming laptop that delivers big gaming performance. Lenovo might be best known for the ThinkPad, but it also seeks out gamers with its lineup of Legion laptops. 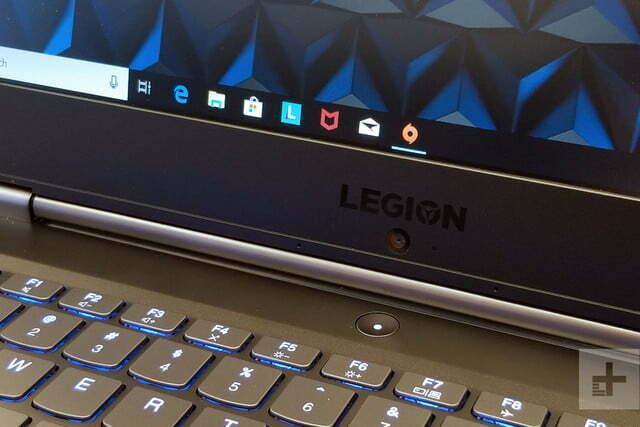 Last year’s Legion Y730 was all about midrange gaming, but in 2019, Lenovo is back with power. The new 15-inch Legion Y740 now packs in the raw capabilities of an RTX 20-series graphics card inside a familiar but attractive looking package. Our review unit came equipped with the Nvidia GeForce RTX 2070 Max-Q, as well as the typical six-core Intel Core i7 processor, 16GB RAM, and a 256GB SSD. 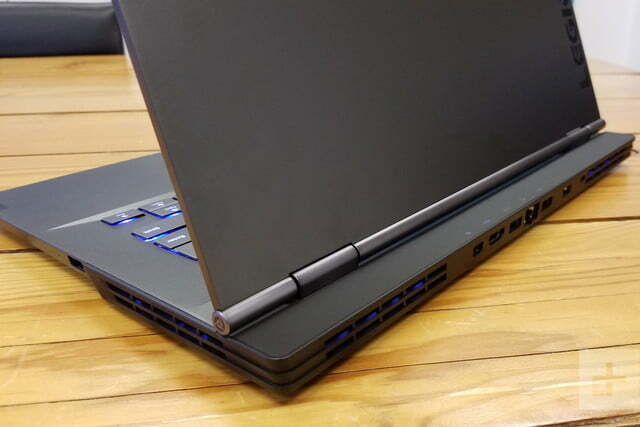 With our specific configuration coming in at $1,900, the Legion Y740 is a bit cheaper compared to other new gaming laptops like the Razer Blade or the MSI GS65 Stealth. But how does that price equate into gaming performance? Does it still have what it takes to make it a good buy? Let’s dive deeper to find out. 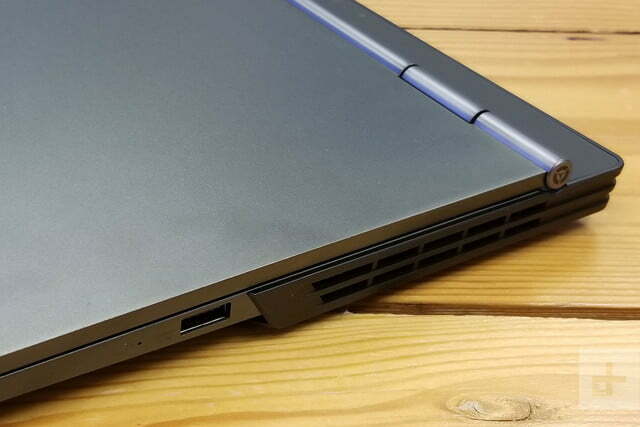 Lenovo’s design choices have always been excellent. 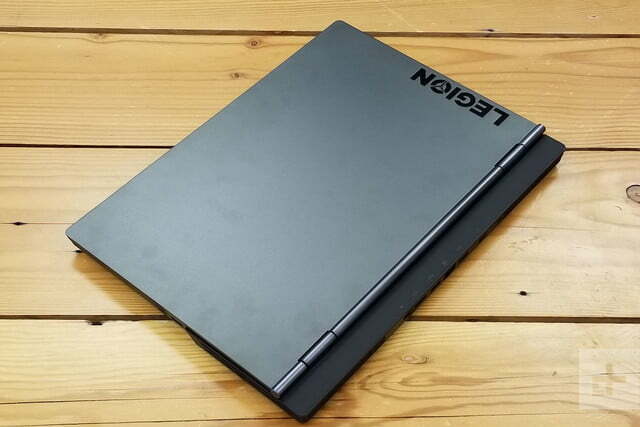 Its previous Legion Y920 followed the science fiction-inspired design language and likeliness of Alienware and other gaming laptop makers. The Legion Y740, though, is different. It keeps looks plain and simple, with an aluminum finish and slate effect that is more reminiscent of a ThinkPad than a gaming laptop. Coming in Iron Gray, there are also no angular finishes or flashy colorways. This means the Legion is a gaming laptop that won’t draw lots of attention if you take it out in public. It is strong too as the lid doesn’t overly flex nor does the keyboard deck press too far down into the aluminum chassis. 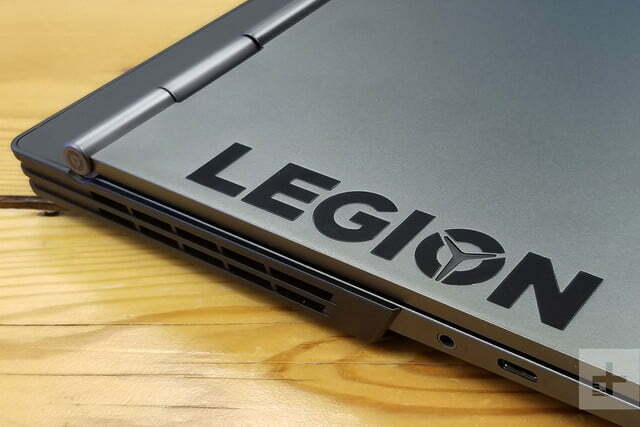 Even the backlit Legion Logo on the lid is subtle, sticking out with a slightly glossy finish. Other than the design, the Y740 remains modern. It comes in with a thin display that chops out the overall footprint of the laptop. 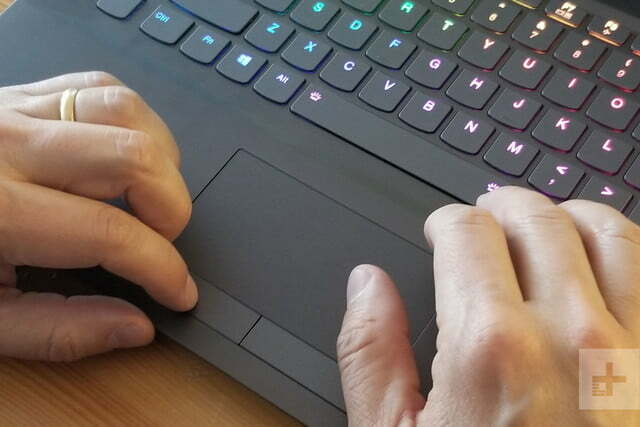 Visually, the bezels are almost on the same levels as the Razer Blade, an improvement from the 17-inch Legion version which sports thick edges along the screen. This does come at the sacrifice of the webcam, though, as it is moved to the middle bottom part of the display. Once a key problem with the older XPS 13, that means for awkward nose-facing camera angles during Skype calls. But since this is a gaming laptop, it might be a worthy tradeoff for most gamers. The 15-inch Legion Y730 packs in the RTX 2070 Max-Q graphics card and all the power gamers need. The Legion Y740 weighs in at around 4.8 pounds and is 0.8 inches thick at its biggest point. That is just a bit heavier and thicker than most other gaming laptops this year. 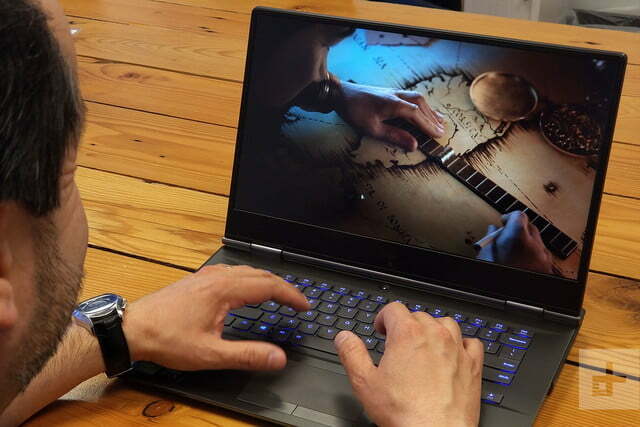 For comparison, the Razer Blade comes in at 0.7 inches thick and 4.5 pounds, and the 17-inch Zephyrus S (GX701) at 0.7 inches and 5.95 pounds. It’s also bigger than a normal 15-inch laptop like the XPS 15, which comes in at around 4 pounds and 0.4 inches in thickness. So, while it’s a bit thicker than some of its competitors, it still feels like a fairly portable laptop, especially compared to older gaming laptops. 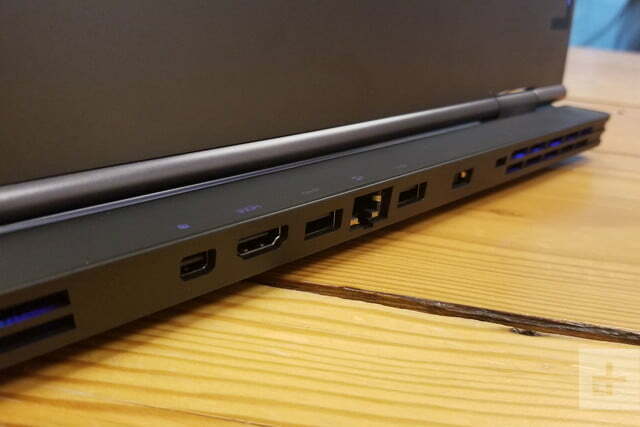 Connectivity includes two USB 3.1 ports, a USB 3.1 Gen 2 port, Thunderbolt 3, HDMI 2.0, mini-Display Port, and an ethernet jack. It is a nice mix, with the most important USB and ethernet ports falling in the rear for efficient cable management. All ports on the rear are lit for convenience, helping make it easy to find in the dark. When we think of gaming laptops, we often think of mechanical keyboards, but that’s not something that can be found on the Y740. Instead, its keyboard is a bit soft, with flat keycaps and a group of macro keys on the left-hand side. That makes the layout a bit uncomfortable and awkward in our day-to-day typing in WordPress. Like the previous Legion Y730, the layout of the main keyboard is a bit shifted to the right, so it takes time to adjust. 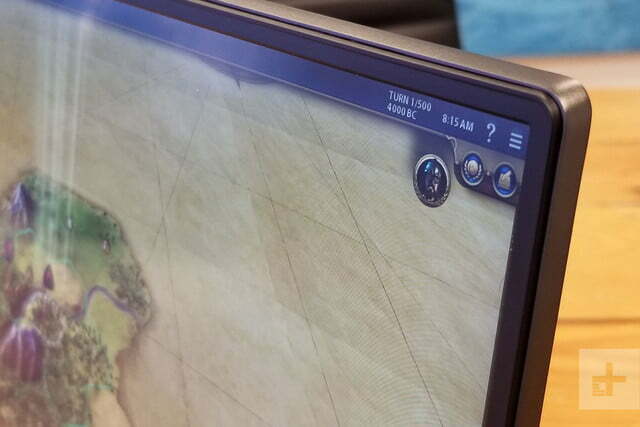 Things aren’t all at a loss though as Lenovo includes touches that serious gamers will appreciate. For instance, the keyboard features 100 percent anti-ghosting technology. There is even customizable zone backlighting via Corsair’s iCUE software. While the per key-lighting is usually preferred by most gamers, you can still use the software to get cool effects as keys are pressed down. Even the colors on the side vents can be changed to your own liking. 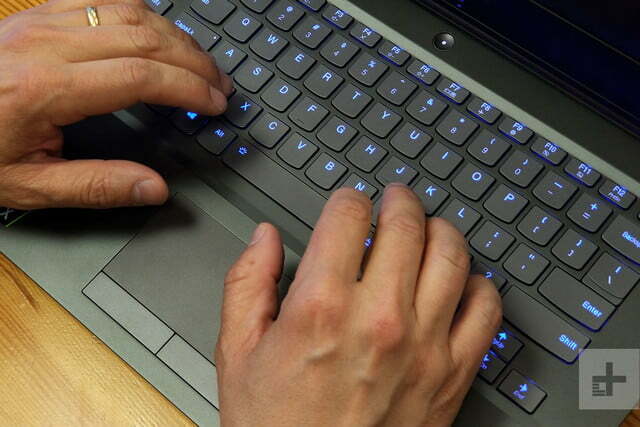 Another important element of any gaming laptop is the touchpad. While the one onboard the Legion Y740 is a bit tiny compared to what you can find on the Razer Blade, its surface will not register unintended inputs. 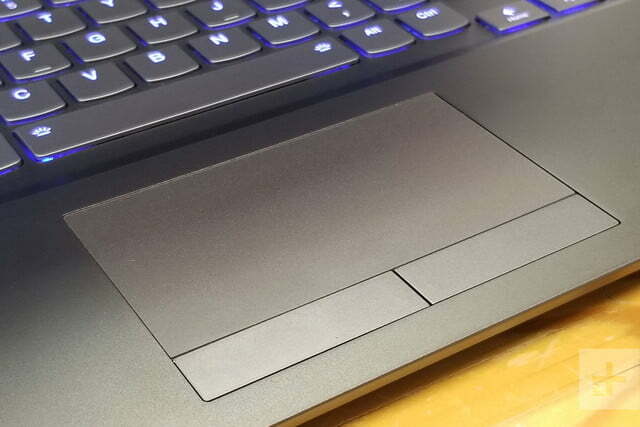 Though the touchpad also does not have the glass surface we typically look for on in gaming laptops, its mylar polyester material is still plenty smooth. It even supports Microsoft’s precision drivers, which means that you can enjoy Windows 10’s gestures. Our version of the Legion Y740 comes equipped with a 15.6-inch 144Hz G-Sync 1080p IPS matte panel. This is currently the only option available from Lenovo. It is not unusual to see a laptop with a G-Sync display, but the combination does mean that we never experienced dropped frames when gaming. 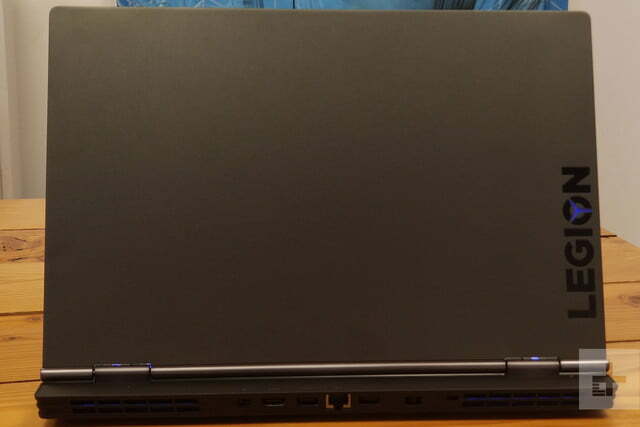 In testing with our colorimeter, brightness on the Legion Y740 gets up to around 300 nits, which is what we expect for most laptops with a matte screen. The contrast ratio is also behind competing laptops like the Asus ROG Zephyrus S, and the average color error is a little higher than what we usually like. The Legion Y740 keeps things plain and simple, with looks reminiscent of a ThinkPad. Still, when gaming, we didn’t notice reflections or glares at most angles. In Assassin’s Creed Odyssey, night-time scenes looked sharp, with a lot of color and detail. Outside of gaming, the panel on the Legion Y740 be problematic for content creators who rather want a more color-accurate display with a high contrast ratio. As for audio, it is provided by a Dolby Atmos speaker system. The two speakers are located on the bottom left and right sides of the system and make for an immersive audio experience. When we pumped up the volume to maximum levels and during our gameplay, the speakers never crackled or blew out. This meant we didn’t always need to reach for headphones when gaming. 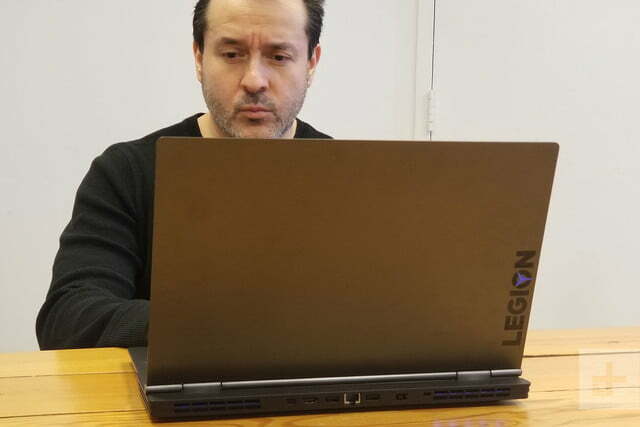 The raw power inside the Legion Y740 is not only provided by Nvidia’s RTX 2070 graphics card, but also with Intel’s Core i7-8750H CPU, which features six cores. This is quite common in most other high-performance laptops, and it results in excellent results in day-to-day tasks like web browsing and multi-tasking. Our unit is paired with 16GB RAM, but a maximum of 32GB is supported and storage can be pushed up to a 512GB SSD if configured with Lenovo. Both are still upgradable after purchase, which just requires undoing some screws on the rear of the laptop. But enough about specs. Geekbench 4 single-core scoring, gives a peek at how powerful Legion Y740 truly is. 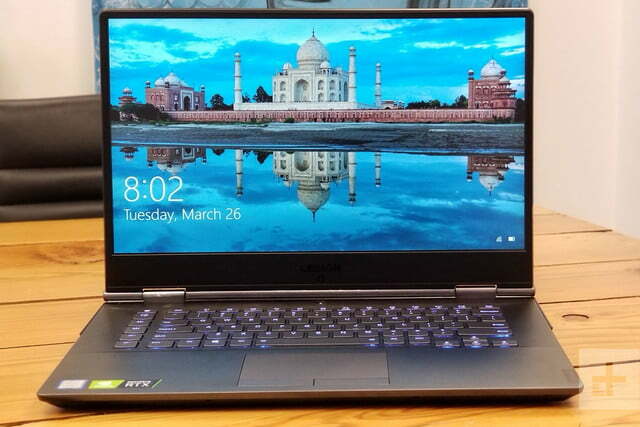 It manages to edge out both the Asus ROG Zephyrus S, as well as the Razer Blade. It can’t come close to the Acer Predator Helios 500, however, which features a more powerful Intel Core i9-8950HK processor. The Legion also fairs well in multi-core benchmarks, which is more representative of more intensive computing activities. It and edges out on top with a score over 22,000. When it comes to storage, the 256GB NVMe Samsung PCIe solid state drive stuffed inside the Legion hits read speeds of 3,422 megabytes per second. That beats out most other gaming laptops we’ve reviewed so far. And, in our most demanding encoding video tests, the Legion Y740 edges out to processes a 4K video in 145 seconds. It is close to the 138 second record set by the ROG Zephyrus S GX701. This all means that the Legion Y740 is a well capable multi-tasking machine and can get any of your tasks done without issue. With prices starting at $1,670, the Legion Y740 can be configured with either the RTX 2060 or RTX 2070 with Max Q graphics card. So, considering support for both ray tracing and DLSS on these GPUs, we were excited to see how the RTX 2070 Max-Q inside our review unit would perform. When heading into our test set of games, we were very impressed with smooth and fast gameplay. We started first with Fortnite. Playing on Epic settings on 1080p led to a 142 FPS framerate – ahead of both the ROG Zephyrus S, as well as the Razer Blade. In the much more graphics intensive Battlefield V, 1080p Medium settings resulted in a 106 FPS reading – slightly ahead of the 103 FPS recorded by the Razer Blade. Likewise, in Assassin’s Creed Odyssey, 1080p high settings resulted in a 49 FPS on Ultra. 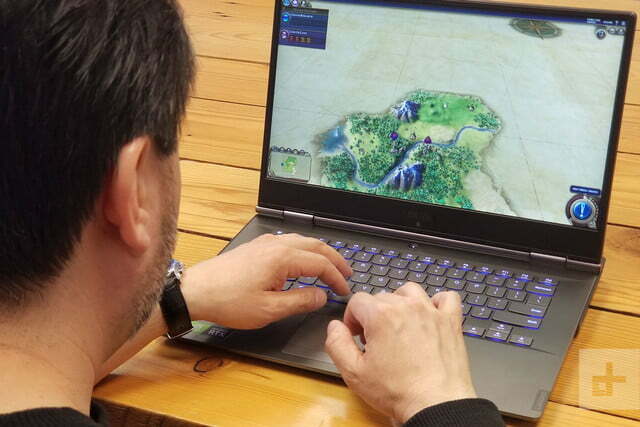 The only exception is Civilization VI, where 1080p Ultra settings led to 101 FPS – behind the ROG Zephyrus. All these games not only played smoothly, but the system was able to stay cool with no throttling thanks to Lenovo’s “Coldfront Cooling.” With fans that have 70 individual blades per channel, this system keeps both the CPU and the GPU cool individually. The areas near the palm rest were not uncomfortable, and airflow is directed towards the rear of the system, instead of the front. The temperatures of the CPU peaked at around 60 degrees Celsius, and the GPU hit a maximum of 88 degrees. Inside the Legion Y740 is a 57 watt-hour battery. That’s become standard on laptops like the Dell XPS 13, which is a bit surprising, as the Legion Y740 is a gaming laptop. Paired with a power-hungry G-Sync display, it all means that the Legion is set up for failure in battery life. When looped through our least demanding video loop test, the Legion Y740 lasted roughly two and a half hours. 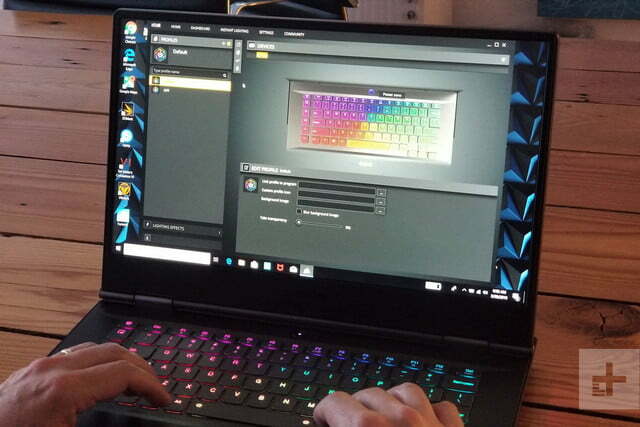 That puts it in line with other G-Sync laptops like the Asus ROG Zephyrus S, but behind the Razer Blade 2019 and the MSI GS75 Stealth. When web browsing, the Asus ROG only lasted for roughly one hour, which is far off the five hours seen on the MSI GS75 stealth. Still, enabling Optimus switchable graphics and disabling the Nvidia GPU in favor of the integrated Intel graphics leads to some improvements. It is a relatively easy task that can be accomplished either through the Nvidia GeForce experience, or via a settings page on the Bios start up. Once enabled, looping a video lasted roughly double as before to a total of five hours. 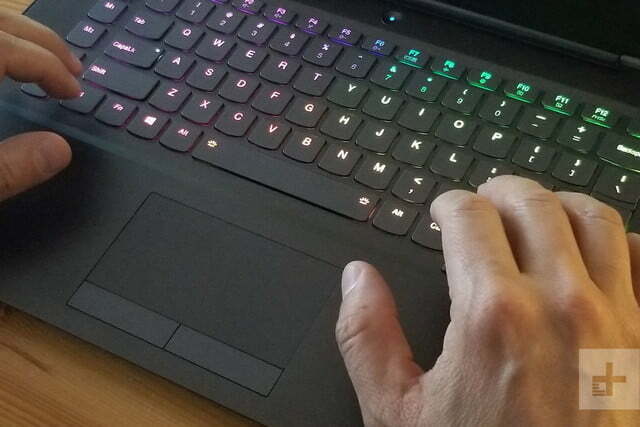 Web browsing also improved up to four hours That still puts it behind the six hours we recorded with the Razer Blade, which leads RTX 2070 series powered laptops in the battery life category. With a unique design and the power of the RTX 2070 Max-Q, the Legion Y740 is a powerful laptop. 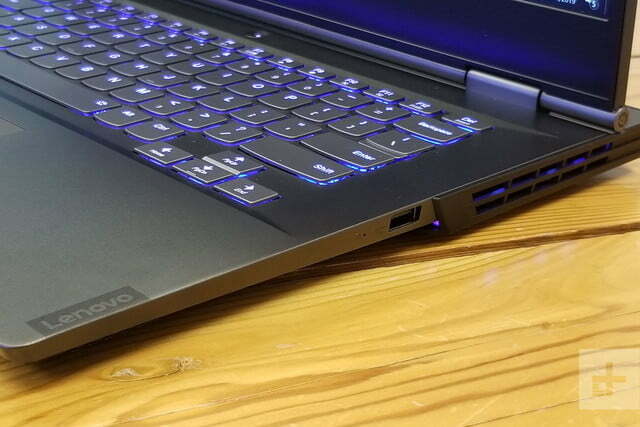 Priced at $1,900, it also is affordable compared to most other laptops with RTX graphics, but only poor battery life holds it back from being the perfect contender. Yes, but only if you’re willing to spend a bit more. Configured to the exact same specifications, the leading option includes the $2,400 Razer Blade. Adding in the same RTX 2070 Max-Q graphics card, as well as slightly bigger 512GB SSD, another option is the $2,500 MSI GS65 Stealth. 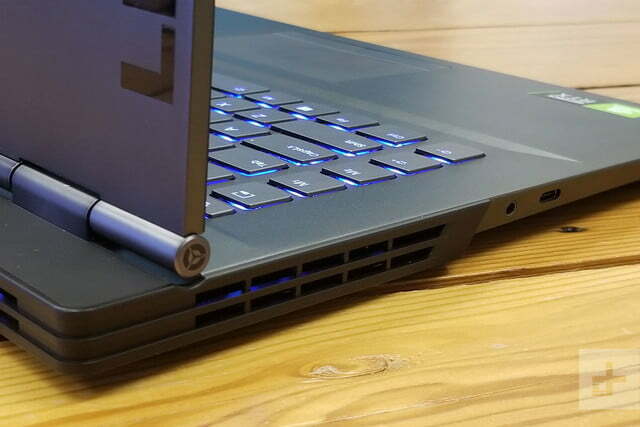 The Razer Blade is thinner and lighter than the Legion, and the MSI GS65 Stealth offers up more room for SSD storage, as well as improved thermals. Just slightly more expensive at $2,500, there’s even a 17-inch version of the Legion Y740, which packs in a much more powerful RTX 2080 Max-Q graphics card. Yes, with prices starting at $1,680, if you’re looking to buy an affordable gaming laptop with RTX-20 series graphics cards, the Legion Y740 is for you.